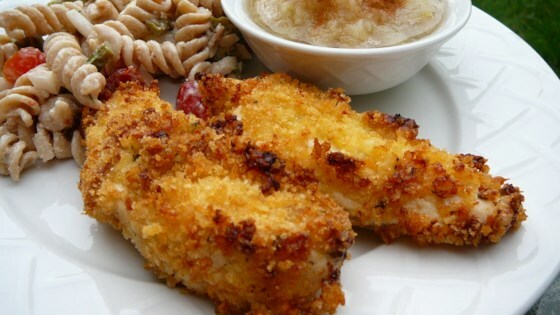 "Flavorful and moist baked chicken." In a bowl, mix the mayonnaise, Parmesan cheese, and garlic powder. Place bread crumbs in a separate bowl. Dip chicken into the mayonnaise mixture, then into the bread crumbs to coat. Arrange coated chicken on a baking sheet. Bake 20 minutes in the preheated oven, or until chicken juices run clear and coating is golden brown. This flavorful, moist baked chicken dish is ready in just 30 minutes. great recipe! I dipped the chicken in Italian dressing instead of mayo., but the chicken stayed so moist and tender, it was great.